Earth Day is nearly here: Monday, April 22. While people have a tendency to contribute donations and volunteer time around the winter holidays, the spring, and specifically Earth Day, is actually one of the most ideal times to volunteer or get involved. The truth is, there’s never a bad season to volunteer time but here are some of the Earth-related volunteer opportunities that make this season one of the best to give back. If you’d like to check out a few top causes to partner with or donate to, you can visit our featured causes to see some of the causes CouponCause loves! charity: water: Clean drinking water is taken for granted in certain parts of the planet and extremely difficult to access in others. charity: water is an organization dedicated to bringing clean drinking water to people worldwide. They do this by assisting in the planning, developing and funding of projects that will create sustainable access to water (and jobs!) for years to come. A healthy future for the human race is totally dependent on a healthy relationship with the planet. 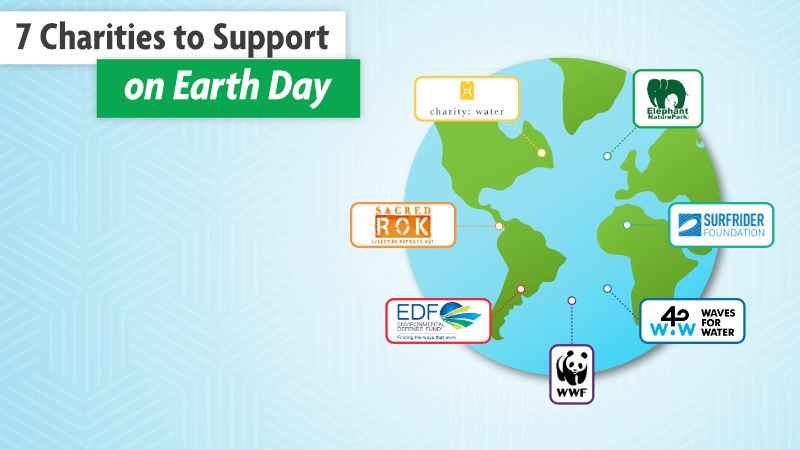 This Earth Day, charity: water is a great organization to consider interacting with to strengthen that relationship. To date, charity: water has funded over 35,000 projects, providing water for nearly 10 million people around the world! Sacred Rok: Being in nature can be a healing and transformative experience for anyone, including incarcerated youth. Sacred Rok takes young adults into Yosemite National Park to explore nature and thus learn more about themselves. Including educational presentations and camping trips, Sacred Rok is connecting with young adults through nature and helping them turn around their lives. Sacred Rok is a top notch cause to partner with for Earth Day this year, especially given their focus on rehabilitation through nature! Sacred Rok also offers a wide variety of gifts that make getting involved with the organization and spreading the word easy and fun. World Wildlife Fund: Perhaps the most recognizable name on this list is the World Wildlife Fund. With a focus on fresh water, climate, forests, oceans, wildfire and food, the WWF is one busy organization. According to Forbes, the WWF was the 64th biggest charity of 2018 and puts 85% of donations back into their programs. 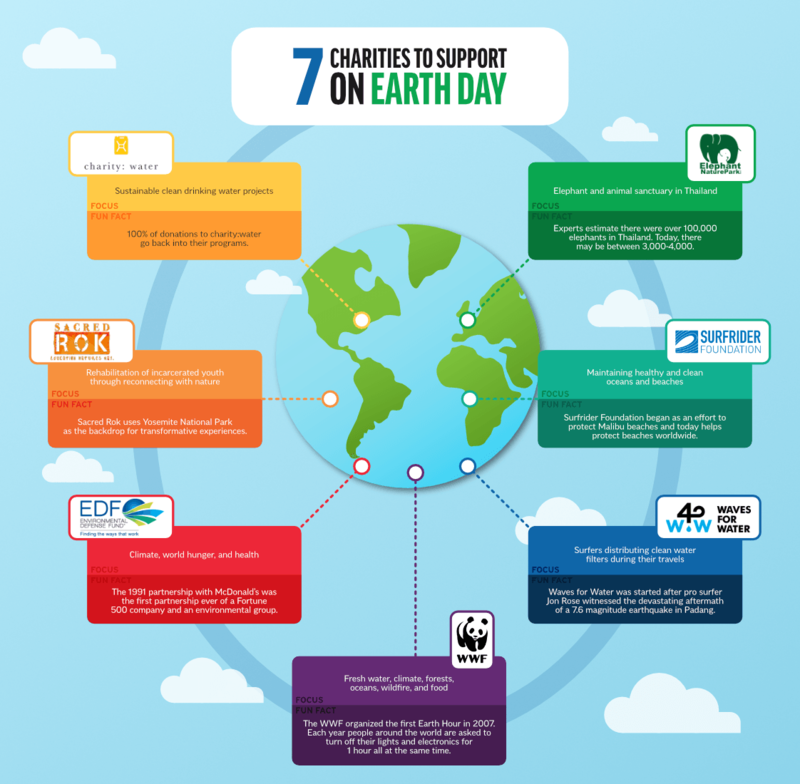 There are few charities as suited for your time and/or money this Earth Day 2019 as the WWF! Environmental Defense Fund: The environment requires active protection in our Post-Industrial world and luckily, organizations like the Environmental Defense Fund exist to help the cause. The EDF is focused on helping stabilize climate, feeding everyone and protecting health. Any season is a good season to support an organization like the Environmental Defense Fund, but Earth Day is an extra motivating time to take part in helping our planet. Just take a look outside at the world blooming and get involved with the Environmental Defense Fund to help keep it blooming for many generations to come. The EDF has over 50 years of experience behind them! Elephant Nature Park: Located in the Chiang Mai province of Thailand, the Elephant Nature Park is a sanctuary for elephants and other wildlife in the region, including buffalo and even cats and dogs. The park helps maintain local traditions and values by employing people native to the region and is completely focused on making the planet a better place. There are various areas of the park where travelers can volunteer time for a day or even a full week. All visits to the park include transport from wherever you are staying to the park itself. Surfrider Foundation: If you’ve ever been to a beach, chances are you’ll relate to the mission set forth by the Surfrider Foundation. There are 5 key areas that Surfrider Foundation focuses on including: Beach Access, Ocean Protection, Coastal Preservation, Clean Water and Plastic Pollution. This Earth Day, you can volunteer with or donate to Surfrider Foundation to help keep our planet beautiful! There are over 85 clubs around the United States that have been growing for the past 30 years. Waves for Water: Another fantastic nature-focused charity to consider exploring this Earth Day is Waves for Water. Waves for Water helps bring clean drinking water to communities around the planet. They do this by teaming up with surfers traveling to third world countries in search of waves and providing them water filters to bring to the community during their travels. In addition to encouraging travelers to bring filters with them, Waves for Water is active in emergency response. They have been there to help after major disasters in places including Nepal, Haiti, Japan and Chile, to name a few.